Food Network is headed back to the Green Mountain State. Recently, the network announced they’ve renewed Baked in Vermont for a second season. Season two of Baked in Vermont premieres on Food Network on May 5th at 10:30 a.m. ET/PT. 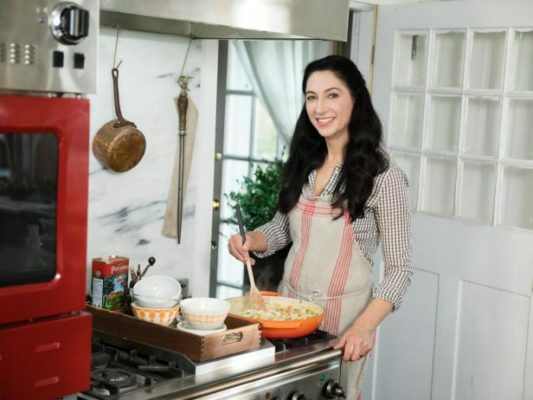 NEW YORK – April 4, 2018 – Cookbook author, acclaimed pastry chef and baking instructor Gesine Prado returns to Food Network in a new season of Baked in Vermont, premiering Saturday, May 5th at 10:30am ET/PT. Over ten half-hour episodes, Gesine shares tips and tricks to help make baking easy, accessible and fun, while serving up delectable cakes, pies and other savory meals at her Vermont farmhouse with family and friends. Whether it is teaching one of her baking classes, instructing how to use leftovers to make delicious pizza and bread pudding, or sharing life hacks on how to have a freezer full of baked goodies ready to go in a pinch, Gesine believes all good things begin with butter and flour! In the premiere episode Gesine and her husband Ray display their new-found love for the sport of curling, as Gesine makes her famous Baker’s Roast Chicken with a side of Beer Gravy for the local curling team, along with Green Beans in Creamy Horseradish Sauce and Rock Scones. In another episode Gesine and her high school friends celebrate the memories of a class trip to Italy by preparing an Italian feast of Bolognese Lasagne, a Caprese Salad and a very special Zabaglione and Berry Trifle, with a side of Chocolate Chip Cookies. And late spring in Vermont can only mean one thing – maple syrup – a perfect ingredient for recipes, whether sweet or savory, as Gesine bakes up a big brunch for Ray’s family, with Maple-Glazed Bundt Cake on tap, along with a Sunrise Biscuit Casserole and Maple Flower Cookies. Join Gesine throughout the season as she welcomes family and friends into her kitchen to enjoy some hearty meals and good times. What do you think? Have you seen Baked in Vermont? Will you watch the new season? More about: Baked in Vermont, Baked in Vermont: canceled or renewed?, Food Network TV shows: canceled or renewed? Please bring baked in Vermont back. Loved the show. If you replaced it with girl meets farm you are so wrong. Please tell us when Gesine will be on Food Network again. I’ve watched her re-runs until I am blue in the face. WE NEED MORE “BAKED IN VERMONT.” Have pity…Pioneer Woman is too much! For gosh sakes, give us some variety!! Gesine is wonderful. Smart, funny and her recipes are stellar! How long do we have to wait for more Baked in Vermont episodes for crying out loud??? I really enjoy BAKED IN VERMONT! Gesine has cute humor along with her wonderful cakes,pies and the tips she gives along the way helps me to be a better baker. Please Please Please bring her back !! I love this show. Enjoy all the cooking tips. We love this show. We enjoy her cooking tips and her recipes. She has such a great TV personality and charm. Wish you were my neighbor 🙂 absolutely love your show and your joy in baking. I share the same passion. So glad I’ve found your program.